Ok, not in the 'finger clicking/girl-frrrrriiiiend' sense more, what I really wear to work. Home based is easy... 'Nuff said really (not in a onesie wearing way), talking to a procurement director whilst rocking a cartoon based ensemble doesn't bode well for a 'high level' conversation, smart casj really.. When it comes to work wear my style is fairly conservative (because it has to be), clean lines, tailored/fitted (in a non whore manner), minimal flesh and good quality! That said, I'm also prone to a work wear bargain and will mix designer with High Street quite happily, especially if I'm wearing a suit. I sometimes struggle for work clothes inspiration as I'm limited by the above. My quest lately, to add a little more colour and my own twist to a look... I spend more time in work clothes than anything else so, really need to step it up! Boucle jacket - New Look last year (maybe longer). Bag - Oasis, also featured in this post. Shoes - These old things??! They are probably my most fave shoes, I picked them up in a Kurt Geiger sale a couple of years ago. Dress - Oasis (again)... 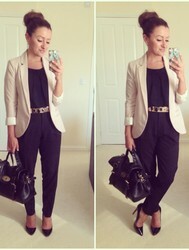 This time with an ASOS gold belt. Shoes - Aldo. Featured in this post here. Buy here, I've just ordered another pair as I copied the link!!! Dress - French Connection in January.. I love this dress but it's a '60-80 denier only' dress.. The hem is waaaay too short to wear without them for work! Heels - Aldo, my previous favourite pair for work that have since been laid to rest! Dress - Next. I picked this one up in their sale a couple of weeks ago. The fabric gathers at one side (very flattering) and is almost identical in cut to a Whistles dress I have. Trousers - Next, slim fit petite. I found these last year and immediately bought a second pair! They wash and wear really well and are still going strong! Blouse - French Connection about 12 months ago however, they have some in now (AND IN THE SALE) here. 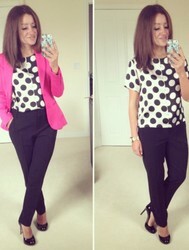 The Trousers - These are the polka dot ones I was on about, purchased from Next 6 months ago. Jacket - Topshop, again it's 12 months old and originally I wore it with jeans, it now sits in the 'workwear' section of my wardrobe. Belt - Next... it just added something to it I think..
Blouse - Warehouse... This is older than my car, my house and most things in my wardrobe combined!! 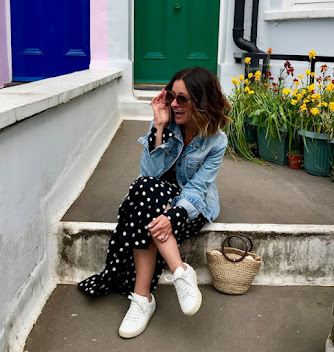 Fitted cardy (because the weather took a plunge a few weeks ago!) - Topshop last year. possibly wear these to see customers!! After posting both of these looks on WIWT recently I was asked if they were jumpsuits.. Nah, just some peg leg trousers, a black top (same black of course!) and a waist belt to hide the join..
Trousers - Miss Selfridge peg leg trousers. Top - H&M. I picked this up last week for about £8!! Belt - I can't remember where it was from.. It's slighted studded and fastens at the back. Top - Wallis - a shear top with a fitted cami underneath, very easy to chuck on! Jacket - H&M, this one was a sale buy at Christmas and set me back a staggering £15!! Does your work environment limit the clothes you can wear? Do you struggle with feeling like you live in the same things? Do you have a go-to place that I need to know about!? PS. 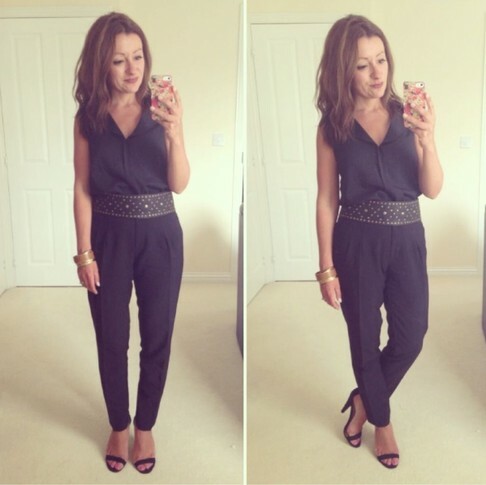 My bestie also posts on 'workwear dilemmas' on her blog here. Ps I really want that next dress but have precisely nowhere to wear it! I like Next because they do petite! I know what you're going through (kinda'), my mum was a primary school teacher and used to come home with the paint handprints! P.S. How good is it you can get in your pre kids stuff!!! I wish I could wear joggers when working from home without just wanting to curl up on the sofa, totally in the mind but I have to feel dressed...Good for you!! 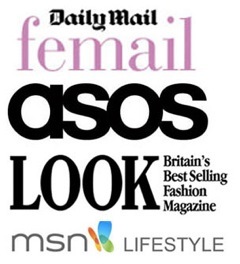 I absolutely love your blog and style, natural, urban and very chic! Hey Lara!! Thank you sooo much, that's really kind of you to say and massively flattering after I have just checked your blog out (and added to my reading list)!! Wow..so many good outfits Mrs M!